put pork, chopped dry shrimp, chopped scallion, chopped ginger, soy sauce, cornstarch and egg into bowl. mix well until the pork is very sticky. wash the glutinous rice and soak in cold water for about 30 minutes. drain. grease tray and put glutinous rice on top. with the pork mixture, make balls about 1.5 inches in diameter. roll the balls in the glutinous rice so that it’s covered evenly with rice. place each meat ball on top of the rice on the tray. steam for 20-30 minutes over high heat. remove and serve hot. place all of the meatloaf ingredients in a large bowl and mix together with your hands. using your hands is particularly good for working out any clumps of cornstarch. make sure everything is thoroughly combined. on a piece of foil-lined baking sheet, spray some pam and form the mixture into a loaf shape. place all of the glaze ingredients into a medium bowl and whisk until smooth. brush half of the glaze over the meatloaf, covering all exposed areas. bake the meatloaf for 10 minutes, then reduce the oven temperature to 400 degrees and bake for 30 minutes. remove the meatloaf from the over and brush the remaining glaze over the entire loaf. return the meatloaf to the oven and bake another 10-20 minutes until the internal temperature reads a minimum of 160 degrees with a meat thermometer. take the meatloaf out of the oven and let it rest for 10 minutes. 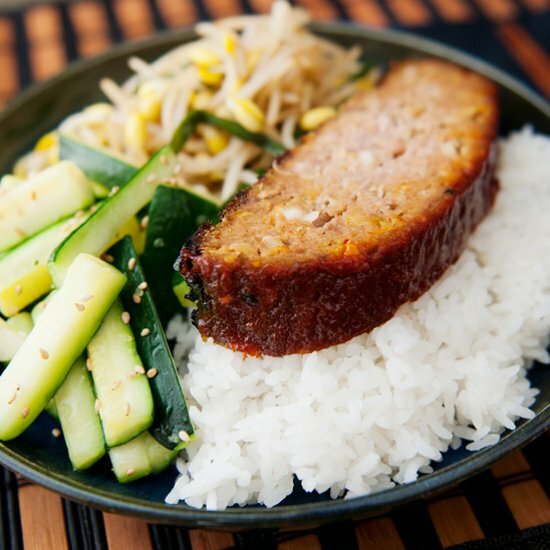 make extra glaze to serve alongside the meatloaf if you are a fan of the sauce.